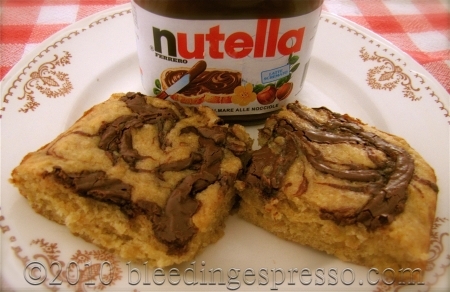 Banana Nutella Brownies: Buon World Nutella Day 2010! It’s here! It’s here! Happy World Nutella Day! Before I get to my recipe, be sure to check out my co-host Sara‘s Nutella and Mascarpone Cream Chocolate Tarts at Ms Adventures in Italy–and remember we’ll be posting the round-up of ALL 2010 World Nutella Day recipes on our blogs on Monday. Be sure to come back! This year, since my frozen overripe banana collection is getting a bit out of hand, I decided to play with a brownie recipe for World Nutella Day: a banana-chocolate chip brownie recipe to be exact. You could certainly still throw the chips in here, but I wanted the Nutella to really shine, so I left them out. I think next time I make this, though, I might add just a bit of espresso…mmmm…. These came out rather cakey, but not crumbly at all. I’m not sure if this is the way they’re supposed to be or not; my oven doesn’t have a temperature dial, so I have to guestimate, and that may have changed things a bit. Either way, they were delicious! 1. In a large mixing bowl, cream butter into sugars. 2. Add vanilla, egg, and bananas. 3. Add flour and baking powder. 4. Spread mixture into a greased 13 x 9 inch pan. 5. Swirl Nutella into top of mixture. I didn’t use any particular technique other than swirling it around with a knife. Martha Stewart would’ve been appalled, I’m sure. 6. Bake at 350°F for 35 minutes or until center springs back to the touch and edges are just turning golden. Okay…these brownies look good even to me…a hesitant fan of Nutella. But if I made these for my Irish, Nutella-worshipping husband, wow, I’d have the happiest hubby on earth. Hope you had a great birthday, Gil! I’m with you. Happy Nutella Day! .-= Grace´s last blog ..World Nutella Day: Friday, February 5, 2010 =-. Mmmmm, brownies! And I love, love, love bananas in deserts, must try these for the next PTA meeting!! Nutella and bananas are an amazing combo. Thanks, although definitely not recommended if you live alone and/or have no one to share with. TOO easy to down a pan in just a couple days. I’ve heard. .-= nyc/caribbean ragazza´s last blog ..French Nutella Toast in Celebration of World Nutella Day =-. Thanks Meredith! Super fast too if you have all the stuff in the house! The banana Nutella combination is a great idea for brownies. These look delicious! yummm, looks delish!! Happy Nutella Day! Thanks Lisa! Hope you had a great WND! .-= Lisa´s last blog ..my little girl =-. ooooh….How you tease me from across the pond. 🙂 These look delicious! .-= Susan & GG´s last blog ..Capucine in Black & White =-. Buon World Nutella Day to you ; ) Your brownies are gawgeous. I adore the Banana & Nutella flavor combination! These are going on my must try list ; ) Baci e’ buon weekend! These did not last very long here, Saretta. Not long at all (and P only had one). Ahem. .-= saretta´s last blog ..Wedding at City Hall =-. 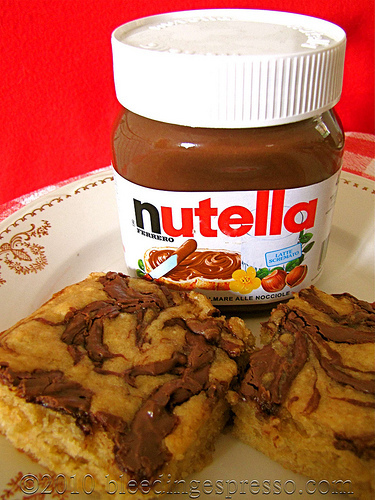 Banana blondies with nutella, brilliant…. i love bananas, i love nutella, and i love brownies. what a delicious match! Oh that’s sad! We go through so many bananas here; I’m glad I had some overripe ones (from a bunch that went ripe *way* too fast) in the freezer otherwise I may never have gotten to make this! .-= Sapphire in Sweden´s last blog ..World Nutella Day in Sweden … Mumms! =-. Bananas and brownies…that’s a new one for me…but it shouldn’t be…such an obvious pairing 🙂 da provare! .-= Sara, Ms. Adventures in Italy´s last blog ..Nutella & Mascarpone Cream Chocolate Tarts Recipe for World Nutella Day =-. I think I’ve been in a cave, because I just saw this morning that it is World Nutella Day. Fabulous round-up as usual Michelle! I posted a link on my site today just because I love this day.. and Nutella!! 🙂 Ciao..
Be sure to check back on Monday, Laurie…we’re looking at 150 or so recipes right now! .-= Laurie´s last blog ..Raspberry Cocoa Biscotti =-. I’m sitting here covered in Nutella, full of Nutella and the remains of my Nutella concoction screaming “diet-guilt” at deafening, ear-piercing volume. My response? None, I’m not even listening…..
Ah! Bananas and Nutella – a match made in heaven! They look divine. Brava! .-= Susan @ SGCC´s last blog ..Celebrate World Nutella Day 2010 with Nutella Ice Cream =-. These sound DIVINE! Oh my goodness, we’re snowed in (and declared a state of emergency!) but ooh this has me wishing I had nutella and bananas on hand! Hope you got some bananas while you could, Kalee! OMG! My favourite ingredients together in one – chocolate and bananas! You are an inspired goddess! Mm, now I know what to do with that somewhat overripe couple of bananas! thank you for this…. Fantastic recipes u have here and wanna take a nice long walk around right away and add u guys to my reader too-cant afford to continue to miss any delightfully delicious goodies cani? There are *so* many great ones to try; hope you enjoy! .-= sugar plum´s last blog ..A JULIA CHILD OMELETTE,GRILLED SHRIMPY PRAWNS aND AN AWARD I OUGHT TO B HAPPY ABOUT….W A FAIRY TALE… =-. Great! We brazilian have lots of banana always! I guess I will try these one… Thanks for sharing and for apreciate my story on Nutella Day, last feb 5th! .-= Adri´s last blog ..Nutella tem gosto de quê? #Nutella Day =-. Magari…I made some plain old banana bread the other day. I’ll have to try this recipe out the next time I’ve got some ripe bananas again. Congrats on a successful Nutella Day! Yes, very ripe bananas are definitely the key. Enjoy! .-= Melanie´s last blog ..Six Places to Celebrate Carnival in Italy =-. I found your website while googling what to do with overripe bananas. This recipe is amazingly delicious. I added 1 tsp of espresso powder – YUM! I’m so happy I found this recipe and I don’t have to rely on plain banana bread when my fruit ripens too fast. Thanks a bunch! I like peanut butter and Nutella on a rice cake! Delish 🙂 And … here’s a funny. I made Nutella fudge to bring to Dave’s sister’s home for Christmas…not knowing one of her adult sons is allergic to nuts! He ended up tasting it cause his Mom said no, there’s no nuts in it…and sure enough had a reaction. Nice! Invite me to the family’s Christmas party for the first time and I poison one of the kids! I make these all the time and they disappear very rapidly. They are simply wonderful. Thx for letting me know, Shirley! Hope you liked them, Paul!